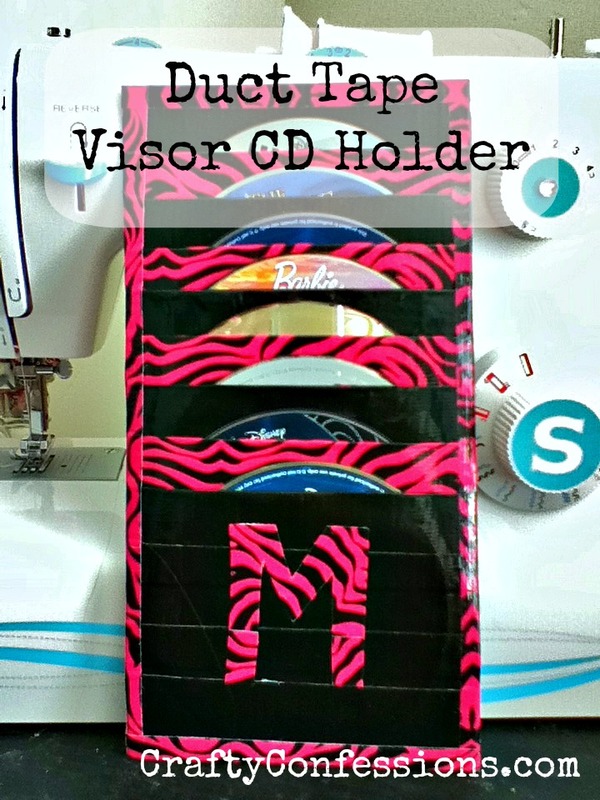 I got tired of CDs flying at me every time I hit the brakes in my van, so I came up with this sassy little holder, and I'll show you how to make one, too! I saw THIS online the other day, but sadly there were no instruction included. After a little bit of pondering I figured out how to make it, and now I'm sharing it with you. Cut your card stock into a piece measuring 10.5 inches by 6 inches. 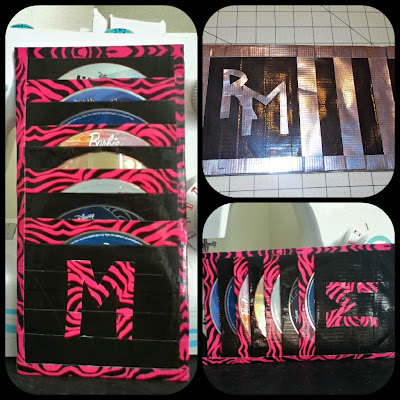 Lay your card stock on a flat, smooth surface (I used my cutting mat) and cover it with strips of tape. Trim the excess from the edges. Flip the card over and do the same to the back. I used a contrasting color for the back. Cover your index cards with duct tape. Leave excess at the top to fold over, and leave excess at the bottom to adhere to the base. Trim the sides. Make 3 of one color and 3 of the other color. With the excess tape at the bottom adhere the card stock to the base with the top of the card about an inch from the top of the base. Do the same with the next piece with the top of that card around an inch or so from the top of the previous card. Keep doing this all the way down. 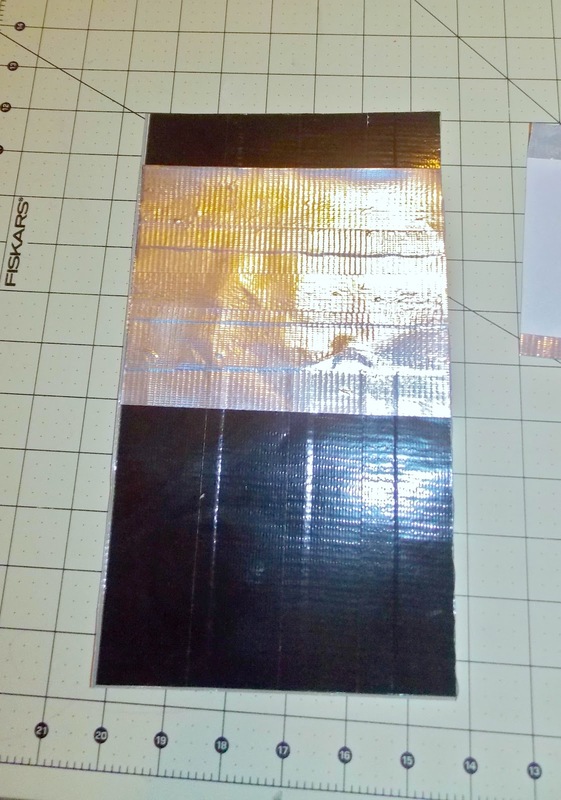 Tear a strip of duct tape the width of the base and fold it over the top. Do the same with the bottom. Next, tear two strips the length of the base and fold over the sides. I highly recommend measuring your visor before making the straps. Not all cars are the same. Tear 4 pieces of duct tape and equal length. Mine were around 7 inches each. Fold the strips in half length wise. Secure the two strips strips to each side of the back of the visor around and inch and a half from the sides. Use super glue to attach them and then cover them with the same color tape as the back of the base. This will blend them as well as give you extra staying power. Attach your Velcro to the ends of the straps with super glue. I tried sewing the Velcro, but the needle got sticky and made a big mess. Hot glue also does NOT work on Duct tape. It will peel right off. Attach your CD holder to your visor, or skip the straps and just store it in your glove compartment. Voila! Isn't Duct tape amazing?? Great tutorial. I will show this to my son. 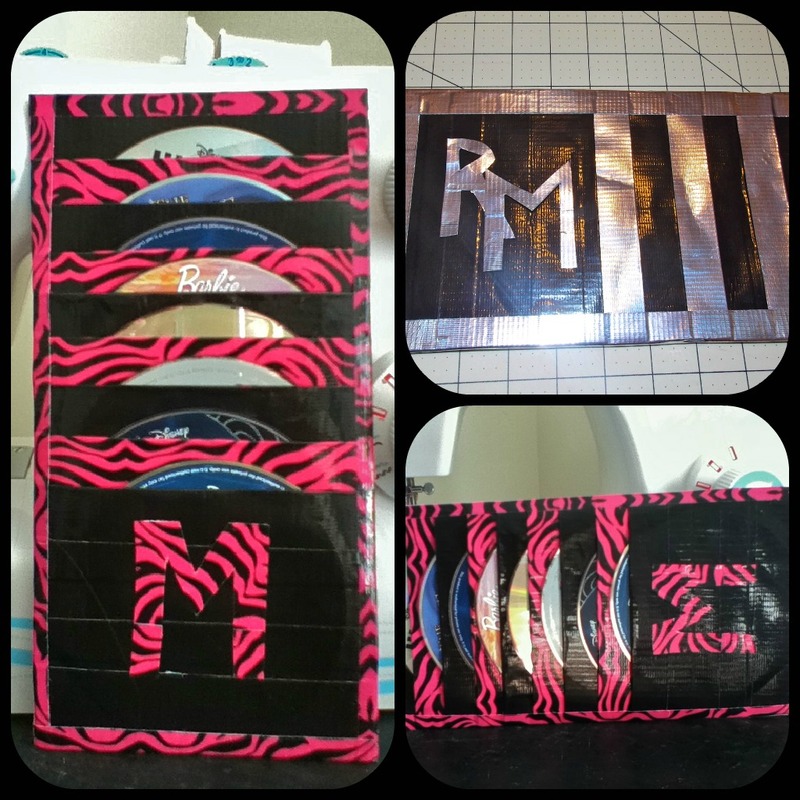 He is a duct tape wallet making fiend right now. This will give him something else to make. I'm your newest follower. I hope you'll stop by Posed Perfection for a visit sometime and maybe even a follow back. This is so clever, and I love the final look. I love this! I would be happy to have you share this and any other idea you would like to link up to "One Creative Weekend" at OneCreativeMommy.com. There are so many great uses for duct tape lately! 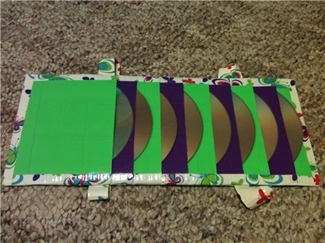 We're going on a long road trip in October and this would be perfect to hold DVDs too. I may make one for that. Thanks for creating the tutorial! you\'ll find so many other eye masks so that you can acquire to be able to Mask enable you to throughout sleep along with other problems. sole regarding these kinds of may be the gel eye mask. there are many a person that USE these types of from a good daily basis with regard to reducing puffiness of approximately ones eyes or soothing the numerous discomforts. thus what exactly can a great gel eye mask do to be able to assist you throughout different ways? If you acquire scoured all the options attainable in exchange for accolade the a lot of adequate Affluence breitling replica eyewear but acquire failed, afresh all you accusation to do is accordance a try to customise your own louis vuitton replica eyewear. If you are analytic for such online destination on which you can architectonics your own sunglasses by upload your photo to accretion how the declared replica handbags architectonics will accessory on their face, afresh you accusation to apperceive about cjblanx.com. Here, on this online portal, you will get some above eye wears, the actualization and feel of which, has acquired massive assimilation from the consumers, worldwide.